I realised, in the last week, just how much I love to create things! Sure, I always enjoyed making things – wrapping gifts, writing a poem or a song, designing and making a dress, but now I felt an even greater joy in the process of creating. It is sometimes tedious, long, and fraught with challenges, but when I see the end-product, I can smile and say, it is good. Furthermore, as I create, I learn more about my own Creator, my Lord Jesus, and my heavenly Father, the Creator of all things. He gives beauty, purpose and life to all He creates, and He says, “It is good.” Let me tell you more about Him, my Creator God. I’ve always been a bit of a nature lover – I love climbing trees, and looking out at the vastness of oceans, deserts and fields. It reminds me of how vast my God is – the vastness of His love, the vastness of His character that calls me to draw closer and discover more. 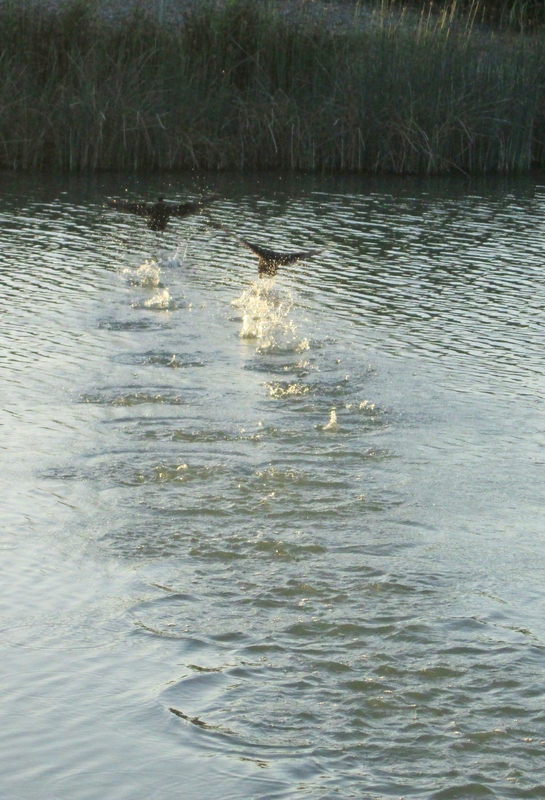 I love watching all the creatures live – the ants lined up in their organised march, the chortle of birds chasing one another mid-flight, the nursery of ducks learning and grooming in the pond. I admire the beauty of the trees, the flowers, and the embellished coats of animals – all of which often inspire the fashion designers, writers and philosophers of today. All this, my Creator God has made – yet more elaborate, more simple, more graceful, and more beautiful than all our attempts to re-create it. I am a daughter of this Creator God, and as He creates, so I also create. As He finds joy in creation, so I also find joy in mine. As He loves, so He teaches me to love. 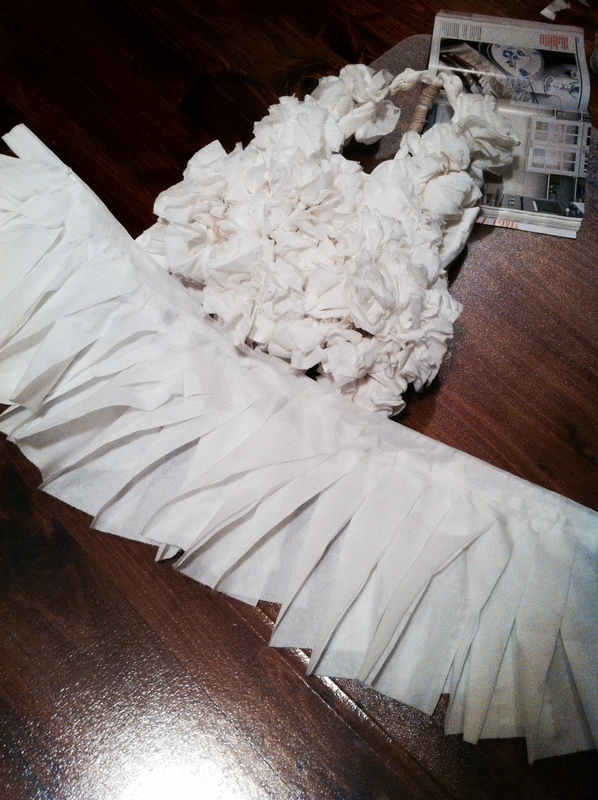 Tissue paper is fairly inexpensive. It is expendable, designated for the most humble of tasks, easily torn apart, scrunched up and thrown away. 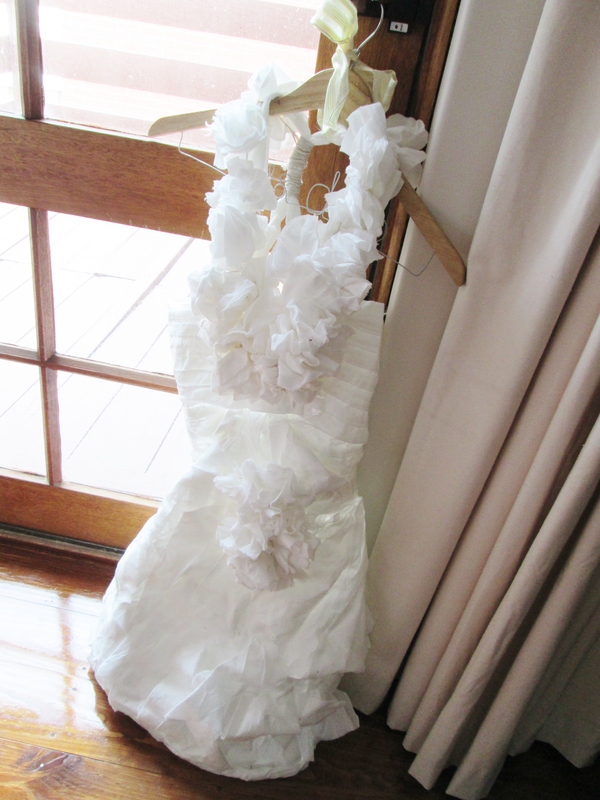 The tissue paper dress game is often played at bridal showers – guests having fifteen minutes to clothe a team member in the fashionable material and showcase their design. It is amazing what people can do with toilet paper in that amount of time! 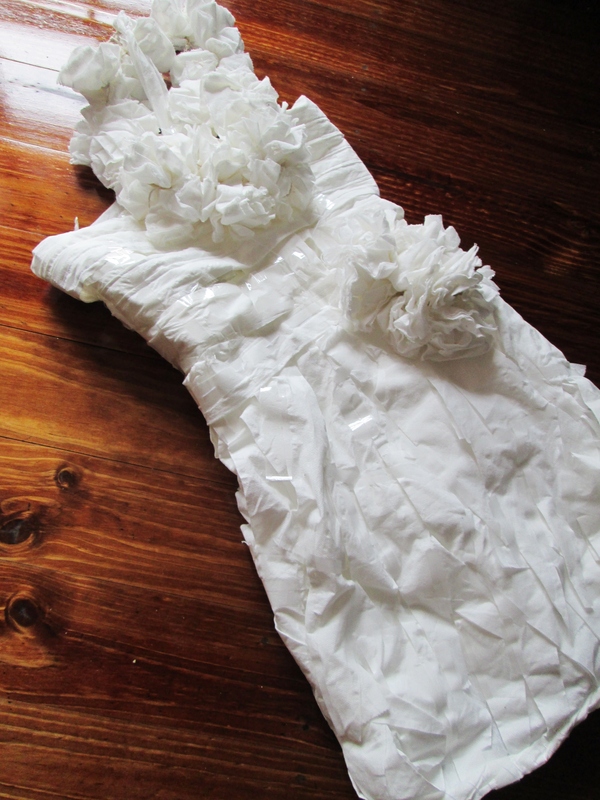 I wanted to have a go, with more time, at making a beautiful dress out of this lowly material. As I did, the Lord began to show me more of who He is as Creator. It is interesting to watch the transformation of a toilet paper role into something much more beautiful. The sheets are torn, cut, twisted, folded, sewn, stuck together and created into something that can be worn, and something that looks good. Man started out in sin, we started out in sin, yet God wanted to create beauty from the ashes of sin, joy from mourning and to re-shape the spirit of heaviness into a garment of praise. From the broken-hearted, He creates healing, from the captives, liberty is made, from the prisoners, stories of freedom, and the poor weave good tidings from their misfortune. Jesus has been anointed to transform our lives. He makes us worthy, when we are unworthy, loved when we feel un-loved, joyful when we feel depressed, and He frees us when we are trapped. The rags of life undergo glorious transformation in the work of Christ’s grace so that life itself is created in Him – beautiful, purposeful, radiant with the image of Christ who created it. (1) God transforms our weakness into strength. Paul speaks about boasting of his infirmities in 2 Corinthians. His infirmities kept him humble, and in his weakness, he sought God. In our weakness, God’s power rests upon us, His strength made perfect in our weakness as we lean on Him. (2) The church, in Christ, is built together as a stronghold. We have an unshakeable foundation in Christ, the Cornerstone, and together, the church is built up as a Holy Temple, the dwelling place of God’s Spirit [Ephesians 2:19-22]. Each member is built in part and purpose, those who seem weaker, being yet necessary, and all members caring for one another [1 Corinthians 13:21-25]. Thus, the church of God, united together, is strong, and cannot be destroyed. (3) God works His power in our lives. When Adam and Eve sinned, and saw their nakedness, they sewed together fig leaves for clothing – hardly durable, but a flimsy and make-shift cover. God, in His mercy, clothed them in garments of skin – warmer, more durable, and a stronger covering than that of sewn fig-leaves. Gives fullness to the temporary of things on earth, His fullness, to fill the broken church, the greatness of His power, the work of salvation [Ephesians 1:17-23]. The moment I first slipped on the dress was unforgettable – the once straight squares of toilet paper transformed into flowers, stripes and patchwork, diverse in form, yet beautiful together. It wasn’t perfect, but I could see its potential, and it could see its goal. When God puts His Spirit in us, He starts to shape us, to transform us, and to work the perfection of His love and glory in us. He sees who we truly are, who He created us to be. May we take on the image of our Creator. Night is worth laboring through. I had a couple of night shifts and I began to sew the dress on the night before I started work. I figure it would help to adjust my sleep cycle so I could sleep in the following day. As I worked through the night, and saw the dress come together, I found that I did not grow tired, but I worked all the more eagerly. It was slow, painstaking process, but I yearned to put the parts together and see at least a bodice, so I kept working, and folding, and threading and sewing. There are “night seasons” in life which can tire us out, drain us, and break us. Yet, even in these seasons, we can hold fast to the word of God and His promises. In the end, there’s nothing like standing back and admiring the work of your hands. 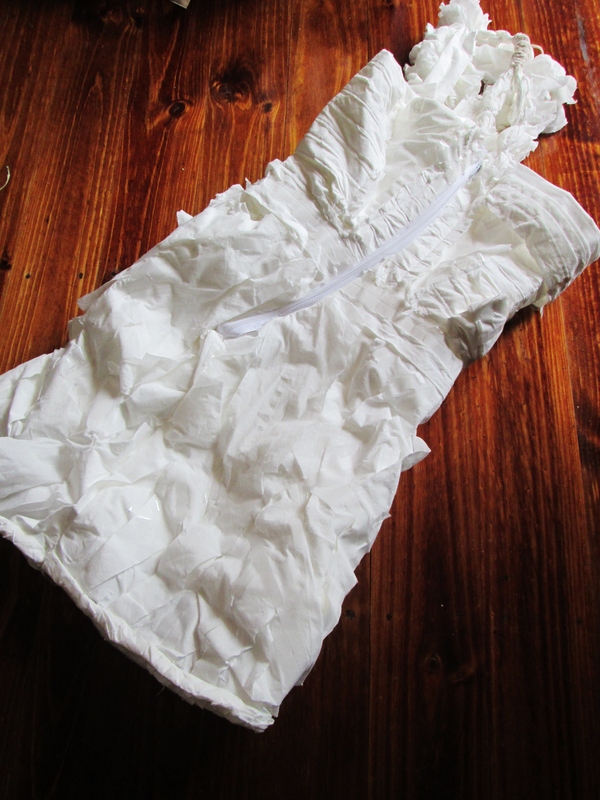 The tissue paper dress is not quite done yet, but it’s pretty close to done. I excitedly took some photos of it and placed it on the hanger to await the final touches. There is such joy in creation – taking an idea, and giving it form – to sketch, design, write, plan, build – to create. It made me think, if I have this much joy making something so imperfect, and so temporary, how much joy does God have in us, who He fashioned in His very own image, to be with Him in eternity! Knowing God’s joy, gives me joy, and it makes my soul (and my feet) dance! I want to know the heart of my Creator God, to know His plans, and His purposes, to understand His creation, and to work with Him in what He is creating next.